This recipe is a flavorful chili with beef, pork, and beans along with tomatoes and seasonings. 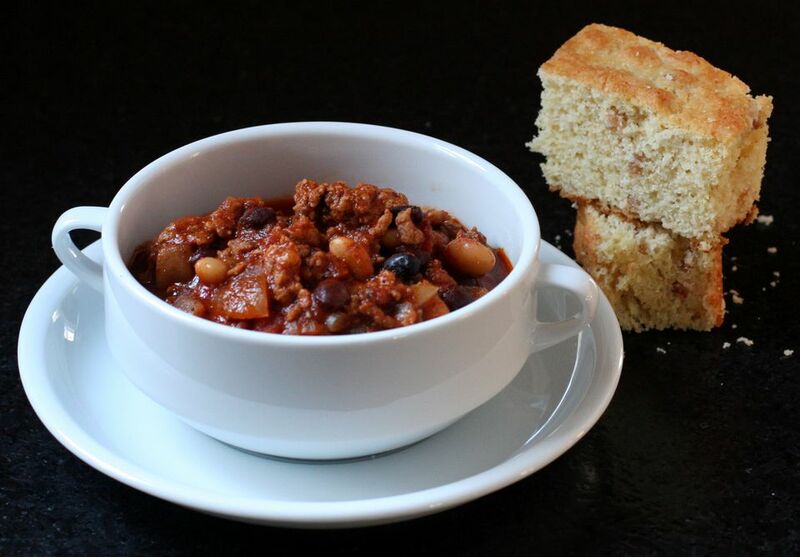 Beer adds extra depth to this tasty chili recipe. Use your food processor to mince pork loin or boneless ribs, or use lean ground pork. Saute the pork, beef, and onions in olive oil or vegetable oil over medium heat until meat is no longer pink and onions are lightly browned. Pour off some of the excess fat. Add the garlic, tomatoes, tomato paste, chili powder, cumin, salt, pepper, jalapeno peppers, and crushed red pepper, if using. Add the beans, and stir in the beer and water. Bring to a boil then reduce heat to low. Simmer, uncovered, for 1 hour, stirring frequently. Cover and simmer for about 1 hour longer. Serve alone or with freshly baked cornbread and a tossed salad.